On the 'The Return of the King' disc one, there is a nine minute SD interview between Monaghan and Wood, played off as a hoax of sorts on Wood. Monaghan doesn't do a bad German, but the joke here is on us, not Wood, as it isn't all that funny. 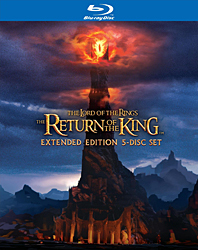 On disc two of 'The Return of the King' Blu-ray, at the black screen, select to view the main menu. From there you get a traditional menu, and another not-so-well-hidden ring in the supplements tab. This six minute MTV feature has Ben Stiller, Vince Vaughn, and Peter Jackson sitting down as the two actors faux-interview Jackson about making a sequel to the 'The Lord of the Rings' trilogy.